Victor was a professor of psychology at the University of Utah for many years, as well as authoring 85 books and journal articles in the areas of marriage, media effects, interpersonal perception, delinquency, etc. After retiring from the University as an emeritus professor he still engaged in a clinical part-time practice. He and Lois were the parents of nine children and at least 28 grandchildren. 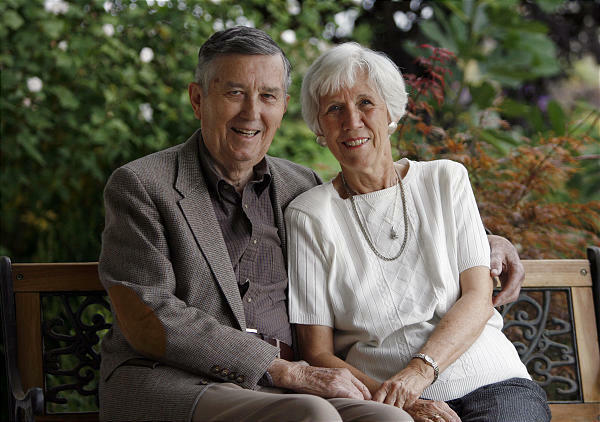 Both Vic and Lois were active in the local LDS community, giving talks, serving on committees, and engaging in many other service type activities. and callings. Lois had a keen interest in health and nutrition and was the family guru when it came to questions in this area of her family's life. After the Clines participated as husband and wife in a Marriage Enrichment program many years ago and found it exceedingly beneficial and helpful, they decided to gather together a group of leader couples who would duplicate this experience on a non-profit basis and give it as a "gift" to other interested couples. This great program has been running consecutively now for over 38 years, benefiting hundreds of couples and families. Both Vic and Lois have passed on now, Vic in 2013 and Lois in 2015, but their legacy lives on. Marriage and Family Enrichment incorporated is a Utah Based non-profit organization formed in 1978 for the purpose of enriching marriage and family life. Its format and curriculum is the result of over 35 years of careful planning and research. The benefits have been uniformly positive for attending couples. All time and labor are donated. No one on our entire staff receives wages or pay for their services. The founders are Vic and Lois Cline and Lee and Lorna Franke . For many years they have assisted couples in finding more fulfillment and peace in their marital relationship. Numerous marriage seminars have been presented throughout the United States as well as in Mexico and Israel. These seminars have provided couples with the necessary tools to strengthen and enrich their marriage. Dean & Joan Connolly and Dave and Margie Mansell are currently the Trustees of the Organization as well as the Presidential couples. The seminar was essentially "free" with the only costs being for lodging (2 1/2 days) all meals, brochures, handouts, supplies, phone, and mail etc. All of our labor would be contributed without recompense. This has proved so successful and popular that we have been invited to do it in many cities throughout the United States, on cruise ships, and in Jerusalem (Israel). We have found, for ourselves and others, that no matter what the status of ones marriage was this experience helped increase the bonding in the marriage as well as taught us skills in communication and conflict resolution that could be immediately used at home. It was safe, joyous, and also benefited us with a spiritual dimension. Of all the things we do professionally and personally this is the thing that gives us the greatest joy. We invite you to attend. Our mission is to enrich families and marriages through seminars, newsletters and follow up support in order to help couples to rebound, recommit to each other, improve communications, and heal old wounds. With these newly acquired skills many couples find that they can truly experience the joy of marriage. Our organization is dedicated to helping couples and families realize their full potential. We know that as families strive for excellence in their relationships, their lives will be richer and more fulfilling. Additionally, we know that as each family strengthens their family, generations will be blessed for their efforts. "It is hard to put into words what an amazing impact Marriage Enrichment has had on our marriage and family. When we came on the weekend we had a good marriage, seven children, and we had a real desire to learn how to make our marriage even better. It was truly profound as we caught a glimpse of or potential as a couple-and even more exciting when we were given the "how-to's" and instructions, teaching us how to reach that potential. Here we are twenty-three years later. We now have 13 children, a great marriage, and we are still growing. Marriage Enrichment has been the life preserver that has helped us deal with life’s difficulties and problems. The tools we learned on our first weekend have helped us grow together through the hard times, enjoy and appreciate the good times, and have truly made us a team as we work together to raise our family."